Many people have multiple cloud storage accounts, but managing them all separately can be a chore. 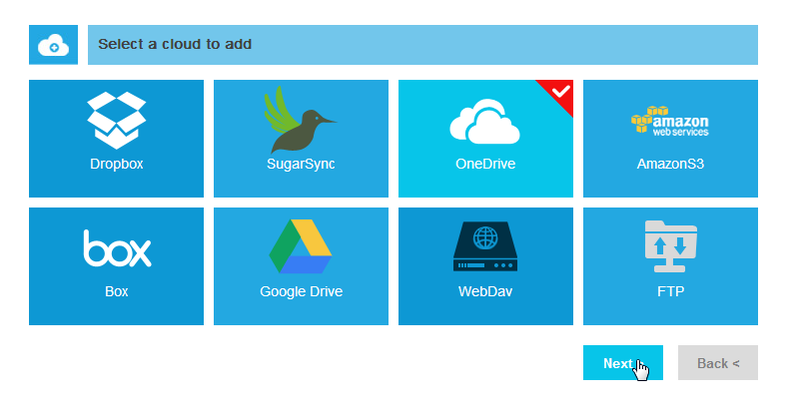 Now MultCloud helps you manage all cloud storage in one place. How does the trouble come? Because the cloud is not only limitless in what it can hold, it can also easily be accessed from any device where has Internet - your mobile phone, personal desktop, work laptop, tablet and so on. Then cloud services are becoming an important part of our life. How many cloud storage services do you use regularly? And you can ask yourself, really say no to free cloud storage services like Dropbox, OneDrive and others? Many cloud services provide a very limited amount of free storage as a trial version. Or you have to pay for extra cloud storage space. So you created and used multiple cloud storage accounts for more volume and free using, but there maybe an increasing amount of usernames and passwords to remember. It is the trouble. Have you ever thought you could build your own free unlimited cloud space by unifying all free cloud storage from different online storage providers? This is exactly what MultCloud does! It helps you manage all cloud storage in one place. Identity management is a challenge. MultCloud is a FREE web-based application that can help you manage what seems like an endless stream of services and allow you to sync, backup or transfer files across cloud services. It is simple to use, with it you can manage all your cloud storage data in a single interface. Now MultCloud supports Dropbox, Google Drive, Box, Amazon S3, Amazon Cloud Drive, SugarSync, Alfresco, Hubic, Evernote, OneDrive, MEGA, CloudMe, Cubby, MyDrive, WEB.DE, Yandex, HiDrive, MySQL, Flickr, MediaFire, ownCloud, ADrive, BaiDu, WebDav and FTP/SFTP. To get start, sign up and complete the sign up process. You will also need to verify your email account to complete the registration. Another way to use MultCloud is experiencing without signing up. Sign in and start to add cloud drives to MultCloud. It is pretty easy. You select the cloud drive from the dashboard, provide it a display name and credentials (in some cases) then click Add Account button. You may have to authorize MultCloud to access your accounts, which is one-time authorization. Once you have added several different cloud storage accounts in MultCloud, you can manage them easily, such as moving files between cloud services, copying, deleting, previewing and sharing files. All operations are done on the web interface, from the buttons or from the right-click context menu. If you consider managing all cloud storage in one place, MultCloud will be your best choice. Integrate cloud storage then you can manage. Maybe you are doubt about its security. MultCloud applies 256-bit AES Encryption for SSL in data transfer, which is an advanced encryption that can effectively protect your data from being tampered, intercepted, and cracked. So you can absolutely rest assured to use it to move, sync and backup data across Clouds.